I’m always looking for new and innovative ways to peddle my stories. While I was on a press trip in Washington State, I met the visitor’s bureau twenty-something social media manager. I asked her whether she thought social media could help travel writers like me get more assignments from magazine editors. Her reply was: “Sure. Everyone uses it, you should too”. I’m always looking for new and innovative ways to peddle my stories. This article explains what I learned about editors, social media, and getting travel writing assignments. So I decided to do an experiment and to find out if social media could help me get my stories published. I already had LinkedIn and Facebook accounts, so I pursued them first. I started posting regularly on Facebook, and beefed up my LinkedIn account with details about my writing career. And then I sat back and waited for assignments. I hoped for a tsunami of editors asking me to write for them. Instead, the results were more like a ripple in a tiny pond. In fact, I didn’t receive a single assignment. I went a step further, did some direct research and went straight to the source of travel assignments. I asked magazine editors, "Do you use social media to find travel writers?" Do Editors Use Social Media to Find Travel Writers? I approached several editors (online and print) with this question. Did they ever track down freelancers through social media? Five editors answered with a resounding “No”. They’ve never used social media to find writers. Flint Whitlock, editor of World War II Quarterly magazine said he “never uses social media at all.” Carla Banning, editor of Lost Treasure magazine “doesn’t think it’s an effective way to locate writers”. Likewise, editors Tom Hauck, Renaissance magazine, Rich Benyo, Marathon & Beyond, and Bobbie Hasselbring, Harbors magazine have never used social media to locate a writer. None of them intend to start using it. Another two editors told me they have tried finding writers through social media. Once. Terri Fogarty, editor of EuropeUpClose.com used social media once, and said, “We got lots of inquiries. But many of these writers were just starting out their freelance career, or hobbyists”. Terri didn’t find the level of experience she was looking for, and says it’s unlikely she’ll use social media again for this purpose. Then I received two positive responses. Rob Hay, editor of Australian publication Triathlon & Multisport, posted for a photographer on a Facebook site and ended up hiring one. “I understand there are plenty of young and capable writers out there looking for a chance to get published, so social media is a good way to contact these people”, says Hay. • Editors don’t use social media regularly enough to keep a freelance writer topped up with assignments. 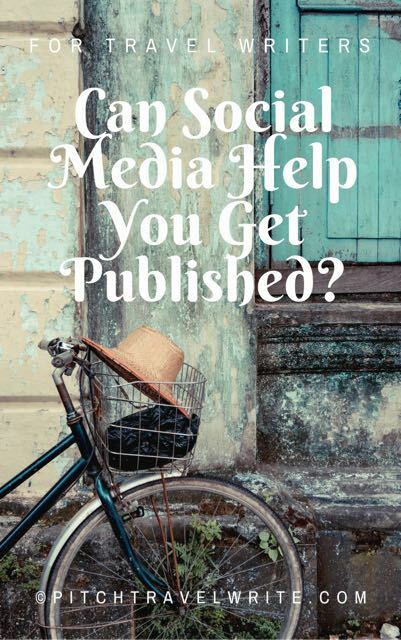 • Editors who are familiar with social media are more likely to use it to locate potential writers. These editors are still the minority. Currently, most editors said they prefer to receive story ideas through good old-fashioned query letters. Maybe this will change as people become more conversant with social media platforms. But, we’re not there yet. This makes sense. When a query letter appears in an editor’s inbox, they have an opportunity to assess the story idea and the skills of the freelance travel writer. Rich Benyo says he finds writers “the way they’ve been found for decades. They see the magazine, want to contribute, and send (email) a proposal (pitch) and some samples of their work”. A well-crafted query letter shows that the writer writes well, is organized, and is eager and motivated to write the story. For those of you who find writing query letters to be intimidating - I’ve written a guide with twenty sample query letters to help you. There’s yet another point to consider. When editors initiate the contact via social media, you might not have the skills or the interest to write the article. But when you initiate the contact through a query letter it means you are motivated to do the work. A social media platform, although nice to have for other purposes, is not essential to assignments. You’re better off dreaming up a unique story idea, creating a solid query letter and approaching magazine editors via email. Your time is also better spent updating and expanding your professional writer’s website. This gives you an online portfolio for editors to review when you send a query letter. Social media, at the heart of it, is simply a place where you can get information, interact with other people with similar interests, and make connections. There are travel-writer-centric sites that fit this definition! These sites link you up with tourism agencies, editors, and possibly an occasional assignment. They’re more specific and helpful than the general social media sites for the masses like Facebook and Twitter. For example, TravMedia.com is a professional site created to link up tourism PR’s, editors, and travel writers. And it works! I’ve applied for three of the assignment requests on TravMedia.com that were sent out via email and landed two of them, both lucrative on-board magazine assignments. TravMedia contains a section where writers can announce their upcoming travel plans for editors to match up with their editorial calendar. What about job sites for freelance writers? There are websites that list jobs for freelancers. Freelanced.com (“the freelance social network”), JournalismJobs.com, FreelanceWriting.com, Online-writing-jobs.com are a few of them. And there are many others. Bear in mind that most of the jobs advertised on these more general sites are for copywriting, blogging and a variety of other freelance vocations. It’s important to check out each site and decide which ones work for the niche or genres that you write in, travel or otherwise. How can you use general social media sites? It’s important to post your professional profile on sites like LinkedIn and to set up a Facebook business page for your travel writing business. These serve as a way to tell the world where you are when you're out and about on a press trip. Here are some Facebook tips for travel writers. But you’ll get better travel writing connections and information from narrower, more focused sites like TravMedia and MediaKitty. These connections are more likely to help you link up with editors and tourist agencies for press trips. You can also look beyond online social media. You might get some different kinds of social benefits by joining a travel writers association. Just make sure to join a reputable organization that serves the interests of travel writers.